Preheat the oven to 190°C/ 350F. Heat a small amount of oil in a non-stick frypan on low-medium heat. Add chopped leek and garlic and cook for around 10 minutes until softened and translucent. Remove half and set aside for the fish accompaniment. Remove pan from heat and stir in lemon rind, lemon juice and cracked pepper. Line a large baking dish with parchment paper or baking paper. Leave enough hanging over each side to be able to fold it back in on itself. Make 2-3 deep slashes in both sides of the fish and brush with oil. Place in the lined dish. Spoon the leek mix (which includes the lemon) into the cavity. Now stuff the tarragon in lengthways. 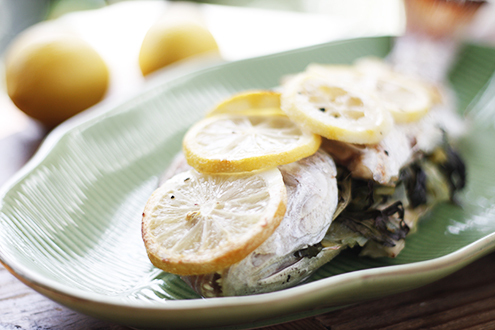 Place lemon rounds down the outside length of the fish. Season with cracked pepper. Fold both sides of parchment inwards to cover the fish. At both ends, fold corners inwards and then fold the paper underneath the fish to completely seal it in. Place dish in oven and bake for 25 minutes. At this point put your cubed and lightly oiled sweet potato into another baking dish. Also place in oven for the same amount of time. When sweet potato is cooked, combine it with the lentils and the remainder of the leek. Season with pepper. For other dinner party recipes try out my Asian Spiced Beef Pot Roast, Tuscan Bean Soup, San Choy Bau or Spicy Lentils. Hi, my friend Mikey from the Artichoke Blog sent me over here – I’m a food blogger currently with gestational diabetes and have found it a good challenge to convert all my usual recipes into GD-friendly ones! So far I’m managing ok but it’s so nice to come here and find all this information with the carb serves already cleverly thought out! Thanks.